Will you keep a secret that’s too good to help’s oneself to improve their way of living for a lifetime? So here I am, making my first blog about cryptocurrency and about a certain ICO Project that worth of sharing with everyone, well every project is a masterpiece. Let me explain their project matter in short as possible with the common words that everyone could really easily understood because as for me and any other readers I want everything to be in simple terms for me to absorb it easily. When you make your own purchase online your data is recorded like your personal information, address, banks account (if there is), sending address and some minor details you want to leave as your customer references. After they send the item you agree to pay and after paying it when you receive the items the customer-service provider transaction end. You may receive also email if you subscribe on their promotional service to notify you in case they will have product sales but if not you’re next contact if you will use their service again. 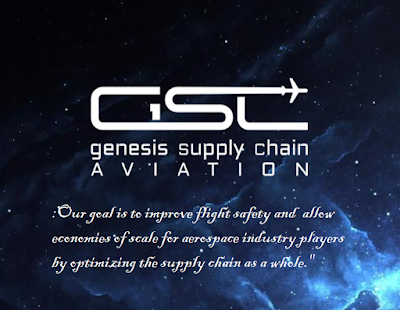 But in Genesis Supply Chain Aviation, they make sure that after you make your transaction as for example buying spare parts of your air transportation they can offer the installation service as well to make sure that the item is connected and place at the proper location and connected to proper wire and tube. They end the transaction when they ensure that you don’t need to worry if you place things right on their location. One more thing is that if you are not sure what part of the transportation vehicle you might need exactly, they can offer inspection service to have a look it for you. As per the saying goes, leave it to the expert! This is to check and guarantee the safety, the comfort of every guest in your aircraft in the future as well as for your crew member who gives direct service to them. Nothing nicer to know about things like this when you have your flight in a certain flight service provider. This is only simple, explicit, bird’s eye view of the ICO project. Become investors to be part of the team or you can become one of the ambassadors who will be spreading the good news to everyone through your skills in marketing and creativity. Oooops, don’t go yet! We have more to share! Bitcointalk.org will have soon the white paper translated to other languages besides Englis so you can fun while reading!